When it comes to variety of styles, rum gives whiskey a run for its money. Dark rum, aged rum, spiced rum, overproof rum, flavored rum… Besides being distilled from sugarcane or sugarcane derivatives, there are few rules when it comes to rum. The downside is many rums, even higher-end rums, take advantage of the lax rules to add sugar or caramel color. This creates a sweetness many identify with premium rum. Such rums may be enjoyable to sip, but they’re hardly the only style of premium rum. Foursquare Distillery’s Richard Seale is on a mission to clear up some of the confusion inherent in the category and give rum drinkers a better way to determine what exactly they are sipping. He’s even proposed new sub-categories of rum to achieve it. Meanwhile, Seale makes some excellent rums, all free of any additives; he only employs rum and barrel time. He’s also not shy about revealing the details of exactly what’s in the rum and what types of barrels were used to make it. While some premium rums obfuscate about how long they were aged or how much sugar has been added, his approach is a breath of fresh air. Today I look at two rums I recently picked up from the Barbados Foursquare Distillery. Both are barrel-proof and, while not impossible to find, will take some searching to locate. As the label makes clear, this rum was distilled in 2004 in both pot and column stills then aged in used bourbon barrels for eleven years before being bottled at a hearty 59% alcohol by volume. Foursquare also makes a port cask- and zinfandel cask-finished version of the 2004 vintage rum. So, if you buy it, be sure to differentiate between them. Expect to pay between $60 and $80 for this bottle. The nose of this amber-hued rum is surprisingly restrained with wood, vanilla, and molasses notes. On the palate, it’s a bold combination of tropical fruit, cocoa, leather, candied almonds, and butterscotch. The finish shows off more vanilla and fruit along with some barrel char. 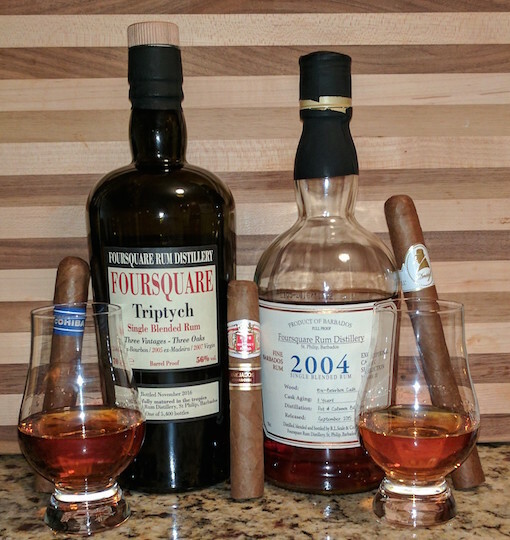 Foursquare’s Triptych blends 2004 rum aged in used bourbon casks (presumably the same as in the 2004 Exceptional Cask) with 2005 distilled rum aged in ex-Madeira casks and 2007 rum aged in virgin oak. The use of virgin oak is unusual for rum, and the combination, once blended, is bottled without dilution at 56% alcohol by volume. Expect to pay $120 or more for this rum, which is limited to just 5,400 total bottles. The result is a deep copper-colored rum with a lively nose of vanilla, wood spice, and just a bit of sulfur. On the palate, it features powdered cocoa, roasted cashew, bananas foster, leather, and molasses. The finish lingers with charred oak and more molasses. Each is an excellent rum and a testimony to how flavorful, complex, and smooth rum can be without any added sugars. Also remarkable is how sippable they are neat despite the high proof. The prices aren’t cheap, especially the Triptych, but if you enjoy rum neat these are must-tries. Good rum always pairs nicely with cigars, and these are no exception. The high proof and full flavor lend themselves to an earthy, full-bodied cigar like the Tatuaje Havana VI Verocu, Sobremesa, or Intemperance BA.